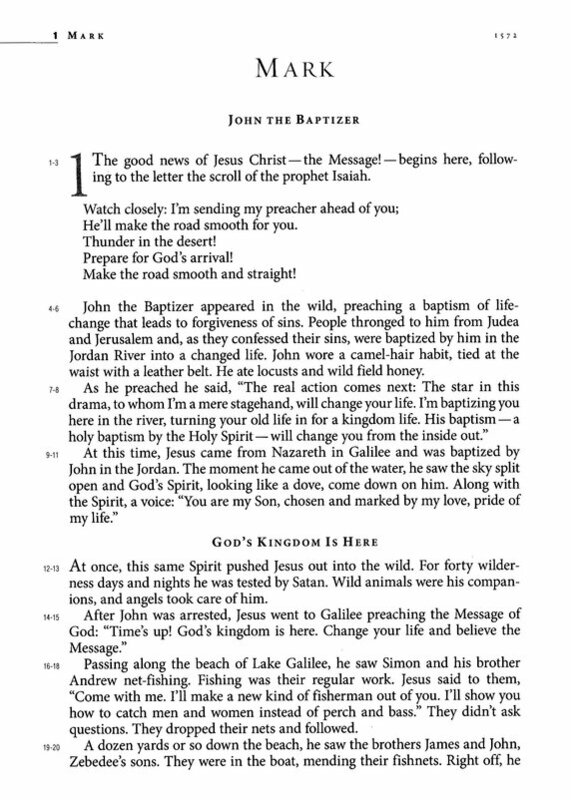 The Message® is a refreshingly unique Bible-reading experience. With no formal language, this Bible reads like a letter from an old friend. Because it’s easier to understand, it’s easier to make the connection between what you’re reading and what it means for your everyday life. With The Message®, Eugene Peterson’s best-selling paraphrase of the Bible, you can join the millions of readers who have experienced God’s Word in the form of a personal message. Enthusiasm for The Message® has boosted its popularity as the most reader-friendly Bible available today. Every book of Scripture unfolds like a page-turner you can’t put down! With no stiff, formal language, passages you’ve read many times before will come alive, revealing the vibrant energy of God’s Word. I have been using e-sword products for over 15 years and it is very user friendly and affordable. I use it on my PC, tablet and iPhone. The iPhone app is the best. Over the years I have changed devices and all I have to do is to download the software and reuse the verification codes. Excellent product and easy to get and use. Although I know comparing many translations is best for bible study...The Message translation is by far my favorite to read and I find myself doing that more for sure. Definitely glad I bought it. The Message bible by e-SwordHelpful and favorable amazing to read, the Word of God more clear and understanding. Really enjoy e-sword. Easy to use. Because this particular bible is easier to understand, I find myself reading more than I have in years. At times, it almost gives one the feeling of watching history taking place! So, so glad I bought this one! The Message uses up-to-date figures of speech and even cliches to switch on a new perspective of understanding of scriptures that are written in a culture less familiar to us. I particularly like to compare this version in parallel with NASB or another more traditional translation. I have used E-Sword for may years now and have found it to be invaluable to me for study and sermon prep. Having so many versions of the bible and commentary at a click of the mouse is as handy as a pocket on a shirt! I recommend E-Sword for anyone who works in the church as a leader or teacher and to anyone who study's the word. The Message is a great study source. 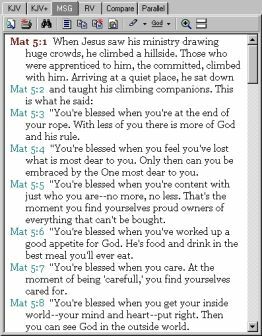 The Message Bible is fantastic at making more passages much easier to understand. I am glad to have in my e-sword collection so I don't have to switch to a different app when I want to use the Message Bible. This makes the e-sword app much more valuable to me in my studies and my teaching. I love it. 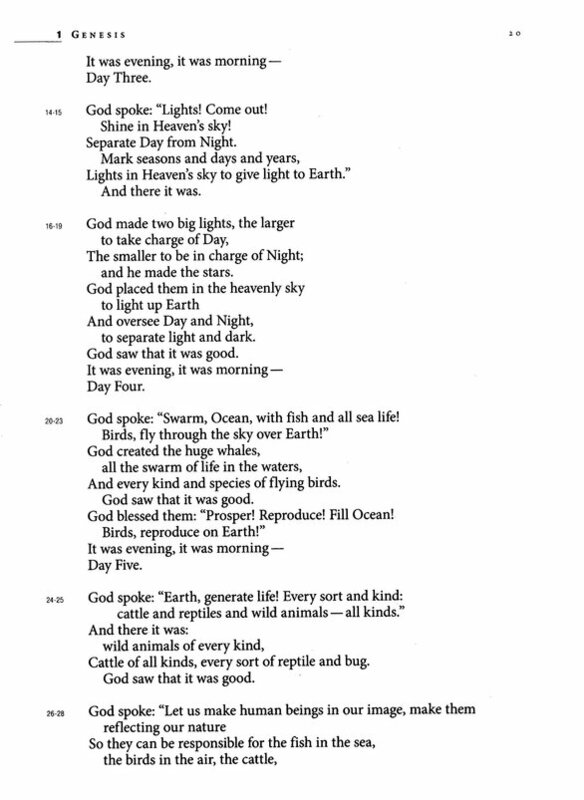 For a long time I shied away from ant translations that weren't the closest to the Greek or Hebrew texts. But with today's culture I realize that there are few who are very concerned about acedemics and complete accuracy . . . even many pastors. When it comes right down to it, communication the truth in a culturally understandable way is the goal. It's much like what the linguists have to do in foreign cultures where people aren't already familiar with the Bible. When I grew up, almost everyone read the Bible regularly and the audience was, of course, a very different audience than we have today. So, a translation like The Message is not only appropriate, but very helpful for today. I have always enjoyed The Message version, and usually use it when comparing to others as if it were part of an interlinear study. The Message version is easy to understand and great for beginners. The eStudySource Message Bible is a great addition to E-Sword. I have used ESword for years. I have used it for every type of bible study and my notes continue to grow. My son and wife asked if I would show them how to use the program. As my wife is a Sunday school teacher for K thru 1st graders she needed a translation easier for them to understand. The Message Bible as well as the E Sword program has made preparing and teaching Gods Word easy for this age group understand and apply the lessons. They are teaching their parents what they learn. Thank you for the tools to help building GOD's kingdom. I thought the NLT was about the easiest to understand, but the Message is somewhere between NLT easy, the amplified, and perhaps the older Phillips paraphrase. I love this translation because its in our everyday vernacular.Well written. While the Message is not a paraphrase like The Living Bible but a translation that takes considerable liberties in the way it interprets the original, That said, The Message has become extremely popular among the full range of intellectual knowledge. I find it an excellent relaxed type of reading to receive a broad look at the "spirit" of the what is being said. So it should be an added source of Bible reading with other more closely translated versions. I give it a firm four stars. It is very special to have "The Message" now in my ESword package, a real blessings and THANK YOU SO MUCH. I have greatly enjoyed using all eSword products in the preparation of my Sunday School lessons for my 3rd and 4th grade boys class. A great system. Thanks so much for providing this service to this 72 years young man. I need all the help you can give in order to keep up with the fast pace of this age group. I decided to read through the bible this year using the Message Bible and Bible Project Videos and schedule. I have read the bible through many times using NIV and ESV versions, but reading the Old Testament through in the Message version is wonderful! It gives a whole different flavor and actually makes much more sense in many cases. Although, I did choose to read Psalms in the ESV version because the Message version was just too different for me, but overall I would recommend it especially for those well versed in the bible. I would not necessarily recommend the Message Bible to a new believer because interpretations are not always literal and the meaning can be misunderstood if not already well versed in the bible. This version of the Bible helps clarify and simplify some of the wording of the KJV. Both are wonderful, I just enjoy reading multiple versions to get a better perspective. Definitely worth it! It was so much easier to add new versions to my E-Sword on my new computer. So many programmes from my Windows 7 cannot be loaded by CD- here is ESword, the same as it's always been, and getting the message on my desktop is a great tool in sermon preparation. Very simple words which puts the message in terms anyone can understand, maybe too simple. I now use it to compare with my commentary on the verses. Not a version to read alone because it isn't always accurate but it a good companion to the King James Version. Very satisfied with this version of the Bible and appreciated that e-sword is free and the purchase of other bible software is affordable. I find this particular version of The Bible very easy to read and understand. I'm currently trying to read the entire thing in ninety days and have no doubt that I'll finish and have a much better understanding of The Bible. This Bible program is great!! I get an email every day with daily reading from the Message Bible. That is how I was introduced to it. I fell in love with this translation. It is very clear in its wording and meaning. This Bible is a plus to your library. The addition of The Message Bible to my eSword app makes it easy to convert any translation of a passage into familiar vernacular which is like the wisdom and comfort of a good friend. My Pastor refers to The Message as "The Red Neck Bible" because it is so BLUNT about what The Bible is saying to us. I use it in Jail and Prison Ministry to help Non-King James Uses (usually Red Necks) to get what was said. I try to use K.J. and Amplified K.J. then The Message as explanation in some areas. It has become my all important bible application used on iPad. I love the use of its dictionary directly from the bible page without leaving that page. You could actually compare bible verse of a particular scripture. Esword could be used at any time just to adjust the settings also. The environmentalist leftists finally have their Bible. Rom 15:13 Oh! May the God of green hope fill you up with joy, fill you up with peace, so that your believing lives, filled with the life-giving energy of the Holy Spirit, will brim over with hope! 1Co 6:10 use and abuse the earth and everything in it, don't qualify as citizens in God's kingdom. E-Sword is great, this work is not. I read and usually study from the KJV and the NLT. The "MESSAGE" version is in a style of its own. Modern English. But I do find some parts take away the meaning of the original text found in the KJ or the Septuagint. Other than that it is somewhat a good read. I am very impressed with e-Sword. I use it when doing Bible Studies. I can quickly find book, chapter, and verse with just a few clicks. So much easier than Bible apps I have used in the past. I have purchased the Message version and the New Living version of the Bible and I really like to compare versions, also using the King James and the ESV which came with my initial download of e-Sword. I also love F.B. Meyer's commentary. In the past I have spent lots of money and time tracking down mulitiple copies of Meyers original little blue books, Through the Bible Day by Day, (published 1914 - 1918) for each of my family members. Now this material is at my fingertips on e-sword. I also love Meyers' daily devotions. My ipad knows the date so the devotion automatically comes up with today's devotion. Many thanks to the makers of this incredible software! I feel that e-Sword is one of the most important resources (what a Gift) on the Internet, presently, today. I can go to the Word of God in numerous versions very quickly and with so much ease, getting a fuller understanding of what the Lord has been telling mankind for thousands of years. The MSG version is especially delightful to have on hand. I use the MSG version to compare with the KJV or NKJV as I read daily. It definitely makes the Word come alive for me in a way that I have never experienced before. I enjoy the New Living Version, but I like the MSG even better. Have been using The Message for my bible reading plan this year, I have often cross examined the translation with The KJ for accuracy and though, at times, different word meanings have been chosen I haven't found any profound inaccuracy. I do find that it causes me to stop and consider what I'm reading in new context, which I consider to be refreshing and insightful. Purchased this for my dad. He loves it. I enjoy this Bible as it gives great insight into passages. The modern language makes me think through my preconceived thoughts and often causes me to adjust them. Having heard Eugene Peterson and his heart for this generation makes this version that much more interesting. It is a great resource to have alongside your other Bibles. The Message will help the reader to understand God's word. It helps to untangle complicated passages. I have used e-Sword for years and saw the The Message Translation was on sale and I decided to buy because this is one of my favorite translations. Thank you so much for all the hard work and offering great translations! It is a refreshingly new way to read the bible. To perhaps pick up on a fresh way of seeing a text and its application to me. It needs to be taken though with reference to acknowledged "best literal" translations such as the NASB or King James because in some cases the underlying meaning of a verse can be different. I prefer the Esword edition of The Message Bible because it maintains the readability while separating the text into each verse. Very handy if participating in a Bible Study where everyone has to read a verse. The Message often gets a comment about how it so aptly communicates the intention of the Writer through use of modern construction. My wife and I read the Bible through together with The Message on Esword and it was very rewarding. I am very grateful for The Message, and especially for Esword, and I note that it is getting better all the time. I have had e-sword for more than 10 years and before e-sword had to delete many versions. But I found that God is into working with all the different versions and forms. it was proven as when Satan brought on an attack of quite a force. God had prepared us for this when I printed out 1Th 2:1-20 on a paper. as we were under duress that God guided our hand to this passage and some others that were printed out and in our KJV Bible. this is the scriptures that were highlighted that we found what was needed for that moment it our lives. This was the moment we realized God was into all the version that are from Him and ordained through Him. Eugene Petersen's The Message succinctly and beautifully articulates what the Spirit says to the churches....and to me as an individual. The Message compliments the other tools that eSword offers the Christian scholar or lay person seeking to know God better. The message bible puts God's message in a more personal language. when you compare to other versions it helps to get better idea of how much God's word is simple and not complicated. Great transaction...great product and works super well with e-sword!! Will do business again for sure. Love the Message bible, an excellent accompaniment to other translations;written in an easy to understand modern language that will give meaning to the text in a fresh perspective. The Message is an excellent paraphrase in modern language, and brings a contemporary edge to study of God's word when used with other translations. I normally use the ESV, but find it refreshing to read from The Message as well because it sometimes highlights things I would otherwise miss. Having the Message Bible on e-sword is brilliant, I can compare versions and choose which one to use for the sermon that day. E-sword makes it possible for me to quickly choose and use text. e-Sword excels any Bible resource I have ever found on the internet and I am still amazed that it is a free,stand-alone programme for any user who wishes to try it. Bible study is a serious business (GOD'S Word !) but can bring the understanding of His will and purpose so simply into our lives. E-Sword makes ways available to follow and grasp the truths God wants so much to communicate to us and to draw on the work of others who help us on the way. The Message Bible is one such work. I have read Scripture for 50 years on and off and have never been so shocked and broken and weeping,revitalised,illuminated as with a searchlight in my spirit,halted in my tracks,encouraged, sternly warned,all at the same time ! If one starts to read a "difficult"book like Revelation - beware, it's hard tyo put it down again before the end. God will speak !!! I have used E-sword for about 8 Years now and can only say that it has changed my life in more ways than one. why would it change your life you may ask well I have always found it difficult to cross reference between different versions of the bible and to find specific passages in the word no matter what version I was using. e-sword with its compare and parallel functions makes this referencing so simple. further the commentaries and daily devotionals give me insight and guidance as I study the glorious word of God. the openness and low level od doctrinal teaching appeals to me in that it leaves me free to do my own thinking and formulate my own responses to the word of god. I often join others in bible study groups and armed with the wonderful preparation which I am able to do with the aid of all the functions in e-sword I am able to made a more meaningful contribution in the discussion groups. I did a lot of damage to my marriage and hurt my wife through alcoholism and eventually agreed to go to a Christian rehab centre 7 years ago now, god touched me there and healed me, but I still had a lot of hurt and anger to work through in order to renew my marriage. being able to research anger, self and other relevant topics has helped me beyond all imagination. e-sword aided this research and made it fun rather than a slog so what more can I say e-sword has helped me change through the guidance of the Holy spirit and God's amazing grace. Totally enjoy reading the Message Bible and seeing how it translates into our modern day. I use it when I am preaching and teaching around the States. The Message Bible really puts words in the bible that can be understood. The integration with e-Sword makes it just one more bible to use and/or compare to other bible versions. This can be very helpful at times as you try to communicate words of the bible in a bible study setting. I recommend this esword version of the Message Bible. It is a great study source to the KJV Bible. When Jesus rose from the dead He made all things new. When we become Christian, all things become new for us. The Message Bible reflects this boundless realm of possibility, (for God's followers are now more than believers, we are truly God's children, God is our Father, we are included in all of Jesus' inheritance. The contemporary language and positive approach of this translation bring these concepts home to us in a fresh way! I chose this version because I am reading a "Through the Bible" devotional. I like it because it is easier to understand. I still like King Jimmy and a close second Amplified Bible for accuracy. I believe the Updated NASB is the most accurate. The Message is more of a story type read with a modern/relevant flavour. Found this version most useful and easy to use. Very welcome addition to my other Bible translations. I've only recently learned of this version and downloaded it because others use it and now it is easy for me to compare with "real" scriptures. Some say it is easier for young folks to read and understand as it gives the general idea in language more appropriate for their minds. Personally, I do not agree with many, many of their wordings and would not have purchased except for the benefits of it being included within the e-Sword platform. This is a great version for helping interperet difficult scriptures found in the KJV or NKJV. It gives me a full understanding of the meaning of the text and what the author was trying to convey. I use it for this and also for casual reading. It is very easy to read many chapters at a time. Overall a great tool in the toolbox of understanding scripture! My thanks to the author for an outstanding work! One of my favorite features of e-sword is the comparison of the same verse in all my translations. ;) Thank you, e-sword, for adding msg to my list. Really like The Message bible I use it at church I like that it is an easy read in todays language. Overall the work is insightful. 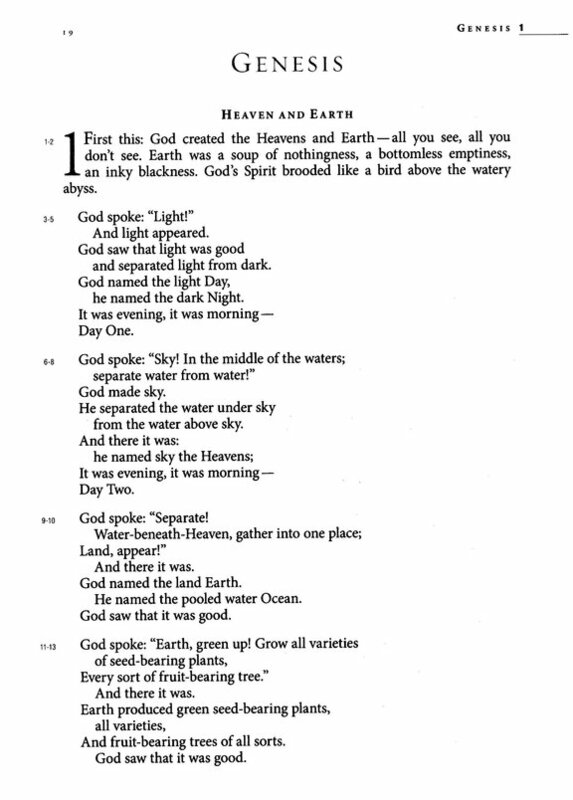 Passages in Ezekiel made me weep, simply excellent! Ephesians 6 broke my heart at the amount that was lost in paraphrasing so simply, tragic. The Message Just so great to be able to enjoy the message, just makes reading so much more alive and clear. THANKS Sooooo Much. To me the KJV gives authority to the scriptures. The Message Bible makes sense out of what the KJV said. The Message Bible is well-written and easily-understandable, but i'm not sure i trust the paraphrasing. It is great for younger readers, newer Christians, or for pleasure reading, but i wouldn't use it myself for in-depth Bible studies when there are so many more trustworthy sources out there. Love the Message, very good to have it on e-sword !! This version presents the bible as simple and as practical as possible: no one should miss it! An outstanding paraphrase translation. The translation reads as smoothly as a novel; still, it has the cadence of a storyteller sitting next to you. A wonderful translation. Well worth the small investment of money. This is one of the Best Bible Translations I have ever read or used. It aids me greatly in my Sermon Preparation and Preaching. Great daily especialy for new christians and those not understanding KJV. Of course Gene doesn't get it right *every* time...have you ever read a Bible commentary that gets it right every time? What Gene has done is simply integrate his commentary with the text, a perfectly legitimate exercise but only "offensive" to those who've never seen it done before. I think it's a great idea! And let me say...when Gene gets it right, he knocks it out of the frickin' ballfield! LOVE The message. kills thr Psalms, though. A while ago I thoroughly enjoyed reading through "The Message" cover to cover - it is of course a paraphrase, but surely one of the best. Peterson has a real gift with words which opens up and illuminates Scripture in a wonderfully challenging way. To have the text available now on my computer with e-Sword's ability to run parallel displays of translations is a real joy. I love the ease with which I can download Bibles, commentaries, etc. for my e-Sword program. The program it self so easy to use. The Message Bible translation is the best tool there is for communicating the bible to people that have hardly if ever, been exposed to the bible and the saving grace of Jesus. The Message Bible is a break down of scriptures, to enlighten your understanding and wisdom of God's word. Proverbs 4:7(AMP.) says it best-The beginning of Wisdom is: get Wisdom (skillful and godly Wisdom)! [For skillful and godly Wisdom is the principal thing.] And with all you have gotten, get understanding (discernment, comprehension, and interpretation). A lovely relaxing paraphrase read. Well worth using, especially when utilized with other translations. As the head of our sound department having steady access to a computer in our sound booth at the back of our sanctuary, it is a real blessing to use all of the packed features of the E-Sword application and Bibles to follow our Pastor's sermons. It is a sophisticated application that is reasonably simple to master thereby enriching one's reading and learning experience. I'm glad I came across e-sword years ago. Our Nazarene Pastor uses The Message Bible for most of his sermons. I purchased it to compare with KJV, NKJV, ASV, and Youg's Bible. It is a great help for my studies since I teach two home Bible study groups and a Senior Sunday School Class. "The Message" is a good read and having a copy is worthwhile if for no other purpose than to be aware of what it says. Just don't buy into the claim that it is accurate or suitable by itself for study. Like all of the E-Sword modules it works great. It adds the icing to the cake when it comes to verifying or filling out the meaning of a scripture. I use it side by side with the Amplified Bible. I love the Message. I do not recommend it for your primary bible either for study or personal use. But I recommend it highly for an additional resource. I find myself reading it and saying, "The bible doesn't say that!" But then I go to my favored translation, the New King James, and read it, and realize that it DOES say that but I've never seen it before. Eugene Peterson has a unique way of bringing God's Word into today's vernacular which makes it very easy to read and which gives deep insights into God's Word which I, for one, would miss otherwise. A wonderful tool for study and life! My initial experience of the Message bible was one of apprehension. However, I have come to view it in a different light. This translation is an excellent read when used as a prelude to the more standard translations. While highly idiomatic in places, the ability to read one of the many books of the bible straight through does have advantages. Peterson’s style is fluid and where necessary close to the standard reading. It takes a bit of getting used to, but does pay dividends. I am very happy with this purchase and would recommend it. To my way of thinking e-Sword rates as the best Bible reading aid that I have discovered. Its amazing versatility is outstanding and I find the ability to 'Compare' a selected verse against all other translations that can be added to e-Sword to be an outstanding feature, providing a great way to clarify the meaning of a reference being considered. The recent addition of the Message Bible to my translation/version selection, has further enhanced the value of the 'Compare' feature. I have no hesitation in recommending e-Sword to anyone who wishes to undertake Bible study/research in a meaningful and value assisted way. I 'ghostwrite' books for two grace preachers, in the USA and South Africa (e-sword has been invaluable for pasting their bible quotations into the manuscripts, thank you from my heart). They often use The Message version alongside scriptures they are 'rightly dividing' in the KJ or NKJ, and I've come to value it (The Message) as a delightful and insightful study addition that, like salt, increases and sharpens the flavour of the meal. Although I generally use the NIV its wonderful to have The Message just to have another perspective on a passage. Often it is in such plain English that the truth just hits you between the eyes! Sometimes with an "ouch" that hurt, but sometimes it just makes you smile. My wife likes to include Bible verses in her emails. She also likes the Message version because it is so readable. The eSword module makes it easy to copy and paste a verse into her email. Thanks for making it available! This version of The Message is the best I have seen so far. The ease of use and the good translation makes the Word "come to life". Really a great product and very affordable, even at the Rand/Dollor exchange rate. Highy commended. Regards, Jacques Pelser. A great version, particularly for the young and young at heart. 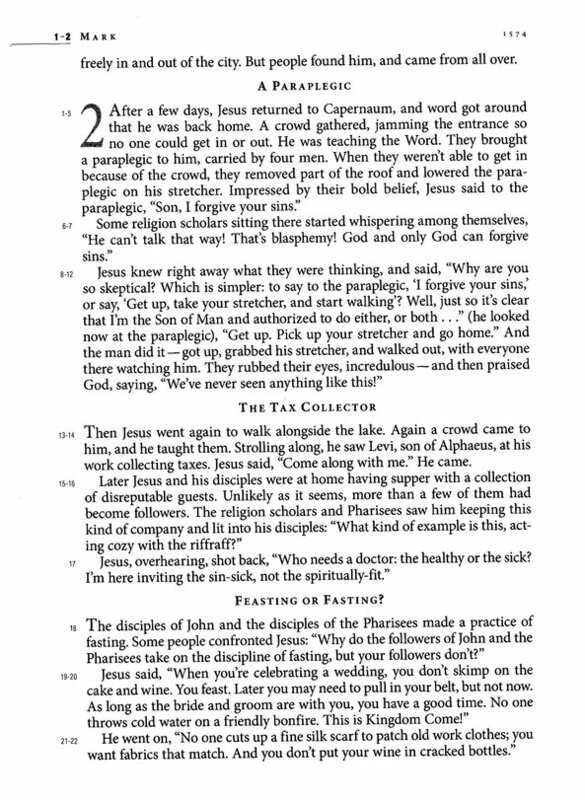 This version is good for general reading or for use with sermon notes as it is easily understood. It is not so good for in-depth personal study or technical study. Worthwhile as a companion version. P.S. - also available at a great price from eStudySource. Thanks guys. Having the Bible translated into modern English can make it easier to understand what the passages are about. English is a fluid language and words from the past do not always have exactly the same meaning or they may not be used in day to day life. One of the best things about the E-Sword bible system is the availability of numerous translations. I was very recently introduced to The Message, which I think compares very favorably with the other translations. It's nice to read scripture form several different Bibles to get the best understanding of what is said in scripture. A great version of the bible that can give insight to every day Christian living. Can be used as a companion text in homegroup setting. 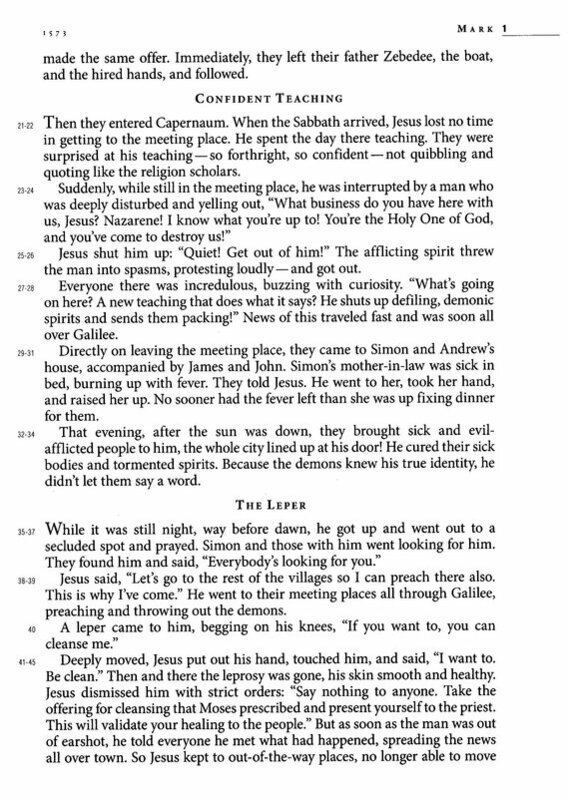 The Message is a re-telling of the bible in modern english which catches the passion of the amazing events. Adding the Message to your modern english and traditional transaltions in e-Sword makes it simple to toggle between the different versions to assist my understanding. I have always found the e-Sword resources very useful. They are great for sermon prep and the ease at which you can compare between versions of the Bible. I have several printed versions of the Bible but not The Message so to have it on the computer along with the NIV, RSV, AMP, KJV etc is an added bonus. My computer is taken to our homegroup meetings which opens up the Word of God even more for us. If you are new to the idea of e-Sword then I would say go for it - it will expand your mind to God's word even more.&nbsp;God Bless all the team behind this program and continue to expand it further. Great easy to read version of Gods word. I have always been a NASB man, studying from it, preaching from it and revering it. Last week, I chose to buy a copy of the Message for use in conjunction with my e-sword software - another product I have held close to my laptop heart! I was amazed at the freshness and contemporary relevance of the work. 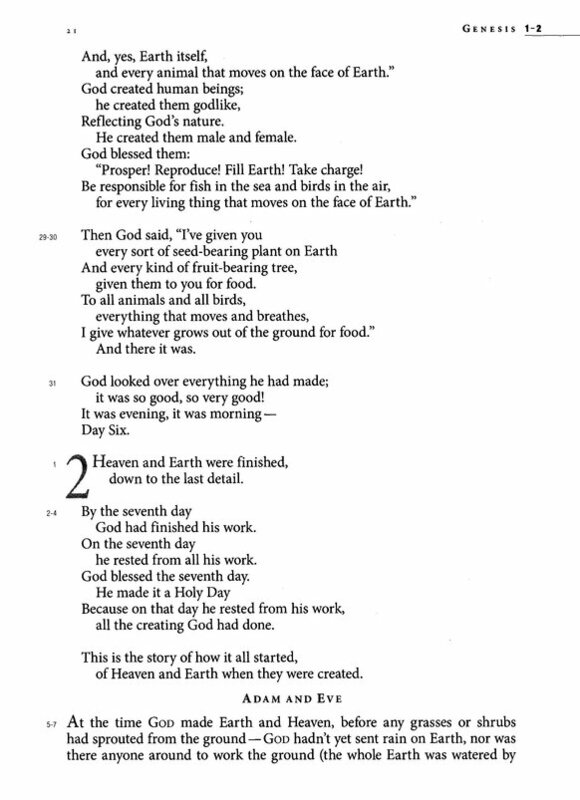 The English is a tad American, and needs 'adjustment' for an Indian audience.&nbsp;For example, Psalm 23 brags about God setting a six-course dinner before me! A little explanation is called for when you are talking to people who barely get a square meal. Ultimately, a brilliant work, that stands out in its own category. Thanks for making it available for us e-swordites. The Word of God has to be presented in a simple way - this one does it. The Message bible is a contemporary, thought for thought version of the bible, and much easier to read than the NLT or the NIV. e-Sword already included the KJV and accompanying Greek / Hebrew dictionaries so at 1/10 of the cost of other software programs you can have access to an incredible reference library, most of which is free. Students at my Bible College use it all the time. When the KJV becomes awkward because of archaic language, you can get a breath of fresh air with the Message bible, it has become my go-to version, replacing the NLT &amp; NIV when I need a break from the KJV. I love the MSG. It presents the Word of God in an very easy to understand manner, highlighting and conveying to the reader the core message of the chapters and verses of Scripture which may otherwise be difficult to grasp when reading the KJV. I would definitely recommend that every serious Bible scholar have the MSG translation of the Holy Bible to hand. Love having this Bible. It adds another perspective to God's Beautiful Word. Even though this is one person's paraphrase, and not a straight translation, it has been carefully, lovingly and beautifully done. Especially from the perspective of someone who is inspired by God's Creation. Nature positively sings of His Glory! I was a professional gardener (horticulturist and teacher) for 25 years ... and came to Love the Lord and His people by first loving his Landscaping. This is a Bible for anyone who can see the wonder of God in a dew drop, and the love of Christ in a new day's sunrise. Enjoy! I have to admit, my main reason for purchase was the low cost. Its a translation that I love so I knew would use it and benefit from the cost too. It served as a trial to see how esword really works out... its got me sold. I'll be purchasing some other translations in the not to distant future!!! Value for money and reading combined!! Thank you soooooo much for the Message Bible. It is very good, and easy to follow and read, expecially with the verses marked. I am very pleased with my purchase and will definitely be back for more as finances permit. As a Bible teacher at a local church, I have found e-Sword to be invaluable beyond words!! I strive to teach exactly what the Word of God is saying, so the commentaries are super wonderful. I did not think I needed the Message Bible because it was not 'exactly' the Word, but a few weeks ago I had one of the ladies read the passage from her Bible (which was a Message Bible) and the clarity of the essence of the passage was exactly what I was wanted to convey. I immediately ordered the Message Bible to go along with the other versions I already had. It is a great Bible for someone just learning to walk with the Lord -- better than a study Bible for beginners. The Message is a easy way to read God's Message in our day today language. Although this is not in any means a way to study the Word, it is a pleasure to bring clarity to scriptures that have sometimes left things unclear. The Message is very useful in flushing out the meaning of a passage. Highly recommend to help people further understand a passage. This version of the Bible will and can open your mind to new adventures in the way one understands stories, parables, and bible context. Just reading the Psalms has increased my desire to read more. Fot the price this has been one of my best investments. Take the time to read Psalm 51. Thank God for E-Sword, which has made reading the Bible more exciting to me. I spend more time studing, research and understand what God has called me to do and be. The Message Bible is easy to understand. I have been a missionary in four countries and currently work primarily with farm workers and others with little education. While I understand the long-time Christian's comfort with older versions, I am much more interested in a new Christian or seeker being able to understand on his/her own. The Message Bible makes it easy for a person to understand the Word of God. My dissatisfaction with this version is that it completely lacks any discernible (to me) literary depth. To me, it is irritating to read. I do feel, however, that it is useful to have this version available in order to point out to me some simpler phrasing which might be easier for younger and/or less educated people to understand. Given an initial understanding, it is then possible to add the depth in one's own words as appropriate to the situation.